I wrote this feature for the Dallas Morning News. It was published on April 22, 2002. Erick Hernandez can talk, eat and sprint at full speed while kicking a soccer ball. All without letting the ball touch the ground. He once kept a ball aloft for 19 hours and 10 minutes, setting a world record. No limits, indeed, for Cuba – the little island that could. It’s an island awash with record holders. Not just in such conventional sports as boxing, volleyball and track, but also in little-known and sometimes wacky disciplines, from body piercing to cigar rolling. Cubans say they compete for world records because they have something to prove. They want to show that for all their troubles – a grim economy, miserable wages and the U.S. economic blockade – they don’t take a back seat to anyone. “We’re fighters. We like to push ourselves to the max,” said Deborah Andollo, 34, one of dozens of Cuban record holders. Her specialty is submersion diving. She once dived 379 feet on a single breath of air. She began swimming at the age of 4 and later spent 12 years on Cuba’s national synchronized swimming team. And that’s when she discovered it: Diving was her calling. But she said she’s content with the journey toward the next record – the planning, the training and the physical exertion. A lot of Cubans are like that, she said; they work hard, play hard and often overdo it, not just in sports but in everything. Jose Castelar Cairo was talking with friends last year and decided on a little excess of his own. 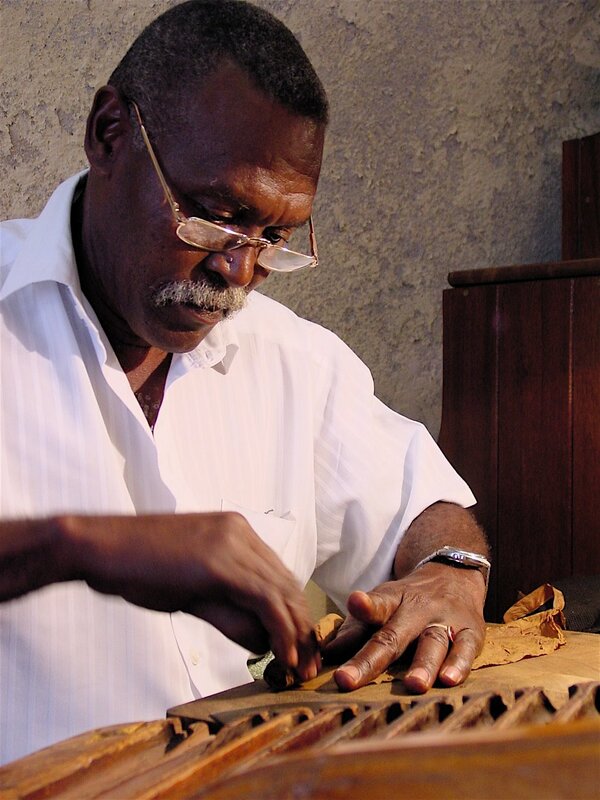 He vowed to roll the world’s longest cigar. Nine days later, his masterpiece was done. But the record-setting cigar isn’t for sale. In another record last year, nearly 500 Cubans – and 74 foreigners – staged a 76-hour marathon, singing 4,872 boleros. That came four years after Cubans danced and sang another type of song – known as the son – for more than 90 hours, also a record. 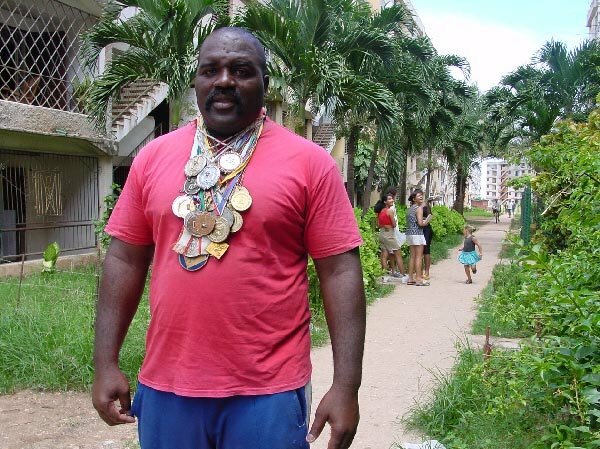 Jorge Fis, a former national judo champion who has won medals in world competitions, says many Cubans go to the extreme in competition because it gives them a chance to travel to other countries. But the sacrifices for any world-class athlete – whether it’s judo or any other sport – are great, he said. “To be a champion, your sport has to be an obsession,” he said. “During my judo days, I sometimes stayed out late. Not very often, but sometimes I’d come in at 3 in the morning from a disco and still went running afterward. Mr. Fis said he was so passionate about winning that if he lost a match, he couldn’t eat or sleep for at least a day, sometimes two. “Judo was all I thought about. Nothing else,” he said. He is now retired, but he can hardly walk a city block in Havana without a fan yelling out a greeting. Other Cubans are still searching for fame. 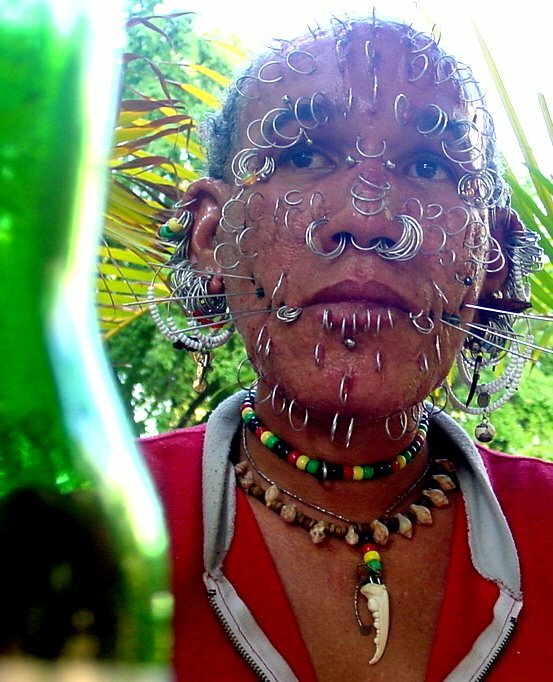 Luis Agüero, 39, is trying to get into the record books the painful way – by piercing his face with rings. He concedes that money is part of the reason he pokes holes in his face. “All the tourists take pictures of me. And they usually give me at least a dollar,” he said. Not bad, when compared with the average Cuban wage of $12 a month. Ignacio Gonzalez, 26, said money was a motivating factor for him as well. His special talent is squirting water out of his eyes. He takes in the water through his nose and into his nasal cavity, wiggles his head around and then forces the water out through a tear duct. Mr. Gonzalez, who works as a store clerk in Santa Maria, east of Havana, said he could also inflate balloons with his eyes. He said he discovered his ability as a child. His parents eventually took him to a doctor, thinking he was crazy. So he performed his feat for the doctor, shocking everyone. A state-run newspaper, Juventud Rebelde, wrote about Mr. Gonzalez and his exploits in May 2000. Since then, he said, he’s appeared on television programs in the United States and Mexico. And he’s gotten calls from as far away as Argentina and Japan. He says he likes the attention. Mr. Hernandez, who holds the record for keeping a soccer ball aloft, said he wanted people to know that Cuba could produce world-class athletes in unusual sports, not just boxing and track and field. He played soccer in Cuba’s national league before dedicating himself full time to what he calls “dominating the ball.” That is, keeping it in the air. *Sprinting 100 meters [330 feet] in 16.98 seconds while bouncing a soccer ball on his leg. *Walking 26 miles while keeping a ball aloft. *Hitting a ball with his head 156 times in 30 seconds. During his 19-hour ball-bouncing marathon in 1998, he said, he nearly fell asleep. “You get real tired,” he said. “People have to throw cold water in your face and pinch you to keep you awake. But then the sun comes up and you get a second wind. “I like this sport so much that I’d do it for free,” he said.